I Heard The First Hummingbird. Just in from my Monday AM walk. Nice morning here, partial cloudy, dry, no wind. Long ago I stopped writing in my log the comment “Alone”, as in I am walking alone this morning, as in no other pilgrims. I am never alone and now when I am the only one walking I write “not alone”. Hope that makes some sense. 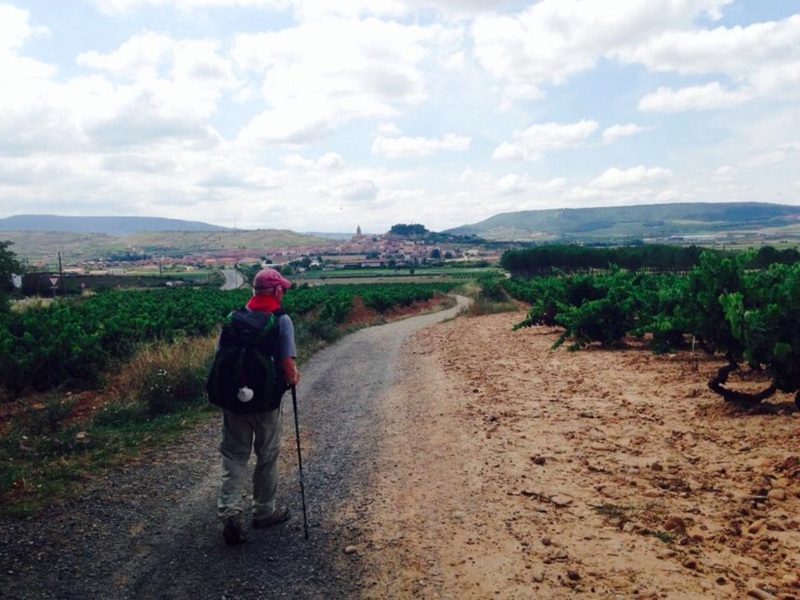 The start and finish of Phil’s Camino. 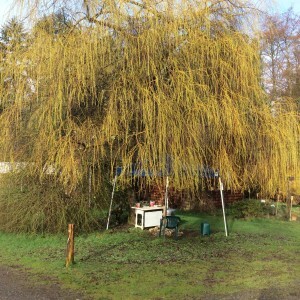 The weeping willow is leafing out. 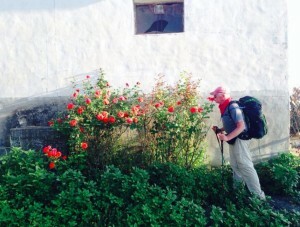 I heard the first hummingbird along Phil’s Camino this morning. He buzzed me and I didn’t see him, just heard him, the wing beat. They are attracted to red and I had my old standby red Camino cap on, although the sun has bleached it so. There are some Anna’s hummingbirds that winter over. Our Jennifer’s got them all over her house because of the feeders that she has out. But we don’t feed them so they start being here when things are blooming. Spring gang! So I’m back from the retreat and it was a busy one. Like I’m home listening to hummingbirds so I can relax after the retreat, right? I’m retreating from the retreat. Now I see Island Wood, the retreat facitlity, just emailed an evaluation questionnaire. Hmmm. I had so much fun with their registration form on the blog a few days ago. OK, a life we have to live and today is important in that, let’s go, love, Felipe. I’m back from my retreat and we walked this afternoon. Cynthia and Roan were here. We are just past Rabe de las Calzadas and 12 kms west of Burgos. 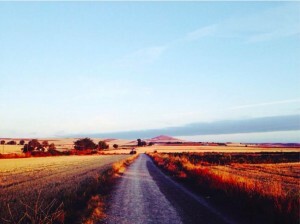 We are starting on the Meseta, the plain of central Spain. Just come, I will be here. Remember you still need your rubber boots. The monumental invention of Fred Arbogast. Way back when, Pilgrim Farmer John and myself (Pilgrim Farmer Felipe) watched our fathers and their friends demonstrate the fine art of fishing. We were little squirts and didn’t realize we were privileged to be learning from masters. This is way back before catch and release, a weird concept. And definitely before fishing shows on Cable. Watching other people fish, I mean strangers, very weird. So just to review I was talking about Gracie’s fabulous smile on a reply to a comment. And PFJ was talking about the ability of some women’s smile to bring him in like a big old bass to a Hula Popper. Now I knew exactly what he was talking about. I know what a big old hog bass weighs to a kid, not only looks like. And I know what a Hula Popper looks like and is capable of in action. Action is the key word here talking about women or fishing lures. Maybe I should stick to fishing here for now. Anyway, the most exciting kind of fishing, in my book, happens on the surface of the water when you can actually see the fish rise and attack the lure. And the Popper is noisy and splashy as you work it in a stop and go manner imitating a careless juicy frog. All that commotion on still water will draw fish from a long way and thus a large part of its success. This elegant little invention is right up there with Monday Night Football as being the possible high point of Western Civilization. I was thinking the nectarine was on the short list but maybe that came out of China. And maybe film as in movies is way up there too. 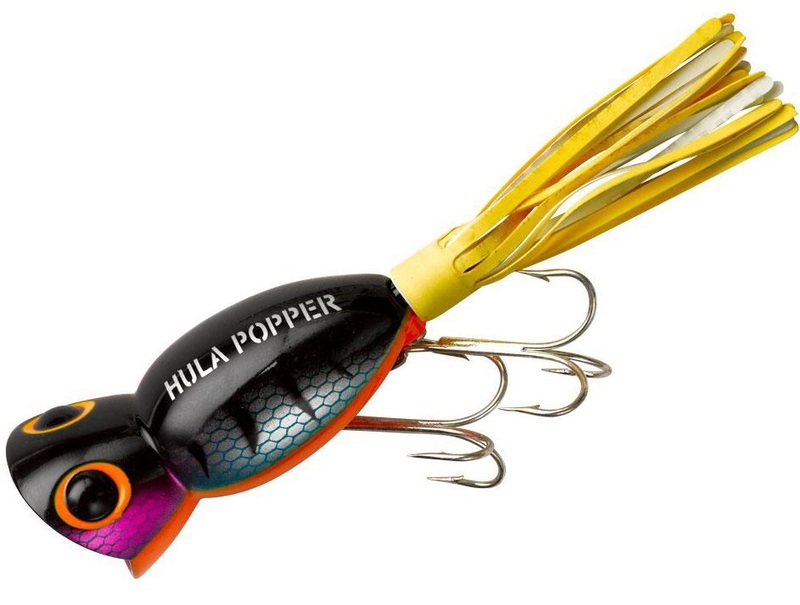 But there is an interesting parallel between fishing lures and movies which used to exist but who the heck knows these days with fishing shows. But it seems that when times are bad and people feel the pinch and need to “get away” they go to movies and/or go fishing. Ticket sales go up and sales of fishing lures goes up. Yea, little known fact. So, Felipe, where are you going with this? Well, ah, just in general I find there is too little fishing going on. 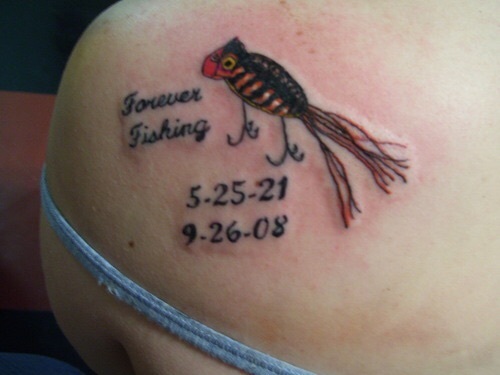 That could be real life fishing or symbolic fishing. Jesus wants us to be fishers of men. Ah. It can be very exciting and rewarding but also when things are slow the time spent watching a motionless bobber can be very restorative. God knows we need some restoration. All kinds of lessons to be had there too. Beautiful, a memorial to a grandfather perhaps. My Rebecca is shaking her head, yes I am writing about Hula Poppers. She never heard of one before yesterday. Thus the value of this blog, broadening horizons. Ever onward, Popper loves, Felipe. Dilly Dallying our lives away along the Camino. I have a Camino buddy in Australia that checks in on me. Her smile first attracted me to her as I saw it in a rush of early morning pilgrims. Somehow, I jostled over to walk with her and it paid off. Despite Kelly’s best attempts to keep us moving we managed to dilly dally our fool heads off at each and every opportunity. That’s our story and we’re sticking to it. Also, the documentary shows her with me in the “collapse scene”. Kelly, Gracie and I went to Mass in this small beautiful old church. I made a scene by collapsing from heat exhaustion right in the middle of Mass. And my big claim to fame was that “I fell into the arms of Grace” right there. You will see her and Kelly (and the mysterious nurse from Netherlands that always seemed to be there when we were in trouble) in the film. Felipe ahead under mercifully cloudy skies. 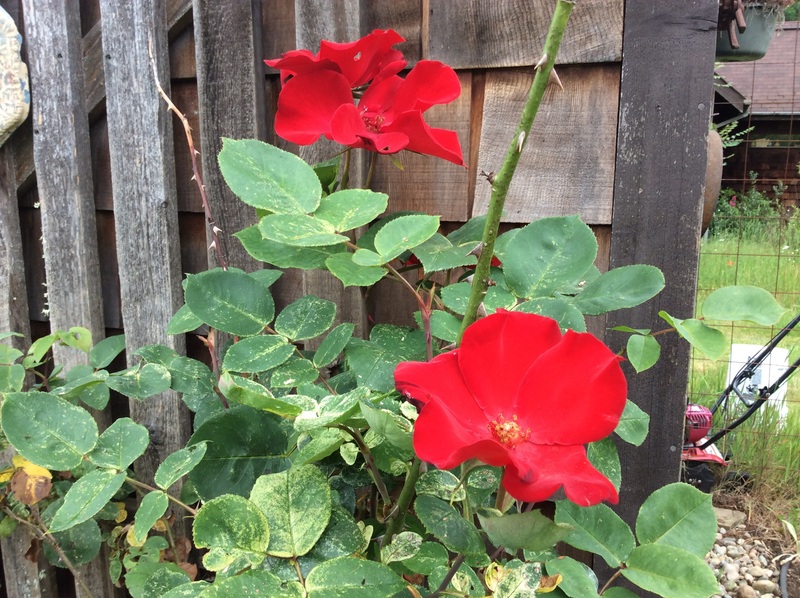 Smelling the roses, another form of serious dilly dally. “here are a few pics i have of you, the first from the day we dilly dallied and daudled the whole way to the next town and arrived very late too some very concerned friends (it was worth it), one of you stopping and smelling the roses, and the third from a glorious morning sunrise falling over the road ahead this particular morning i was walking with you kelley and emily i remember that beautiful orange pink light from the sunrise making me all types of happy. That’s the way it is for me, for us, today with a tear in my eye, love, Felipe of the Camino. Pic just in from Gracie in Australia. We were all lucky to be there! Everytime I hear that word I’m back in that Humphrey Bogart movie and “Badges! We don’t need no stinking badges!”. Yea, but this is 2016 and we do need the official badges to get around at the upcoming film festival in Austin. Waiting for the official email with news on that. Ah,the life of a movie star. Yes, not all glitz. And Pilgrim Farmer John in Iowa has started a campaign to flood the festival folks in Dubuque with requests for Phil’s Camino. What a guy! We have to start something in Seattle to stir up trouble here. Michele? Yup, and it’s springtime (almost) (on the verge) (95%) (close as can be) (particularly) (at least hopefully) here at the ranch. Busy time of year to get everything done that the change of season dictates. Then we have these pesky film festivals to contend with. They couldn’t do them in the rainy season? Let’s see what else is going on? Ah, Mrs Graves (My Rebecca in her teacher role) gave me a “Cute” on my blog post yesterday. What? Well, I jumped on it and lobbied it up to a Cute+. Yea, at least. Well, OK, have to run and make it all happen, making hay while the sun shines. Ok, the email from South By Southwest just came in with the stinking badges, ah the badges. Keep it all going there where you are, love, Felipe. I am off on a retreat this coming weekend. There will be fifty men there from all over Western Washington, Bible Guys I call them. The shindig is put on by Teleios, an umbrella outfit that oversees over a hundred little neighborhood bible study groups. Anyway, the main guy, Art, walked the Camino last summer and took my walking sticks across Spain again. And Bart, Art’s mentor, walked with him and is the guest speaker this weekend. So you can see the attraction for me. Well, we will do some serious bible study and discussion for sure but maybe get some time for Camino chatter between things. So I am off to this other island, Bainbridge Island. The retreat is at a “retreat center”. OK, yes. Most times if I feel the need to retreat I just pull my cap down a little lower over my eyes. I don’t get over there hardly ever to Bainbridge so this will be different. Visiting a friend maybe on the way. So this morning I’m filling out the really official registration/emergency/who’s your lawyer/ online guest form (the “risk waiver form”). Man, I don’t know but it kind of made me feel like I was from a different planet. That’s not very inclusive. Maybe I’m getting old, you think, but it’s definitely a different world out there these daze. So on the form, one section was the dietary restriction choices. Geez, I didn’t know there were so many conditions out there. What did we do before this? Somehow reminds me of Marine Corps boot camp, in an opposite way. SOS for breakfast for everyone. If you didn’t like that you could try and find somewhere else to eat, I guess, the Officer’s Club maybe? Yea, but noticed they didn’t have kosher dietary restrictions down there, on Bainbridge Island not Parris Island. That’s an obvious flaw. OK, then I got to the Disability Requirements Section. It was a big blank. that’s intimidating, no choices? Look, I am not making fun of anything or anyone but just this form (my disclaimer), OK? I was tempted to put down something really silly like “all sidewalks must list 17 degrees to starboard” but held myself back. I mean it was a big blank on the form, inviting my creativity, right? Not wanting to leave it blank I put simply, “Not today!”. So, yea, one day at a time for this retreater. 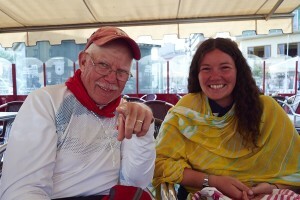 I am walking Phil’s Camino this PM, with no disability requirements required, God willing. In other words, “Not today!”. Love you, you know what I mean?, Felipe. Dusty love as the trail goes on. After my big Sunday with Father Marc, Gardener Terry and Sister Joyce working me over I had the decompression of walking and tapas. We had some new folks for the trail walk which is always good. But really it wasn’t till tapas with my Rebecca and Catherine y Dana that I finally was able to take a breath and put the day in perspective. That’s what tapa time is for, right? Yes, and it was one of those tapa times that are so good and bountiful that it turns into the evening meal and Bob’s your uncle after all. We had the standbys of smoked fish, salami, cheese, crackers, pickles and of course olives. But an addition to this that I must mention is the quince jelly. C y D had made this out of fresh quince last fall. Apparently there are areas along the Camino in Spain where it is quite common to serve this as a condiment. I don’t remember it but it may have been the area between Leon and the Samos Monastary the I bussed through. But the quince is such a forgotten odd fruit that just because of that it may need a revival. I have seen half a dozen in my life, which would be like seeing something every ten years, rare really. So, just an idea to check out. It will definitely raise your grade on the next tapa spread you serve. Yum. And maybe this odd little fruit has a lesson for us Caminoheads. We who walk ancient trails, search and commune, who are we really? We who walk at two or three miles an hour in the dirt but with the vapor trails of jets high overhead with folks traveling modern speeds. Maybe we are the almost forgotten odd little fruit. And maybe we are part of the revival? Onward, to read the blogs of Richard Rohr and Terry Hershey. Thanks for being here with me. Sweet quince loves, Felipe. 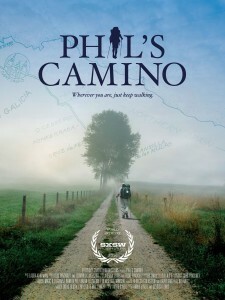 Well there is big big news on the Phil’s Camino front! 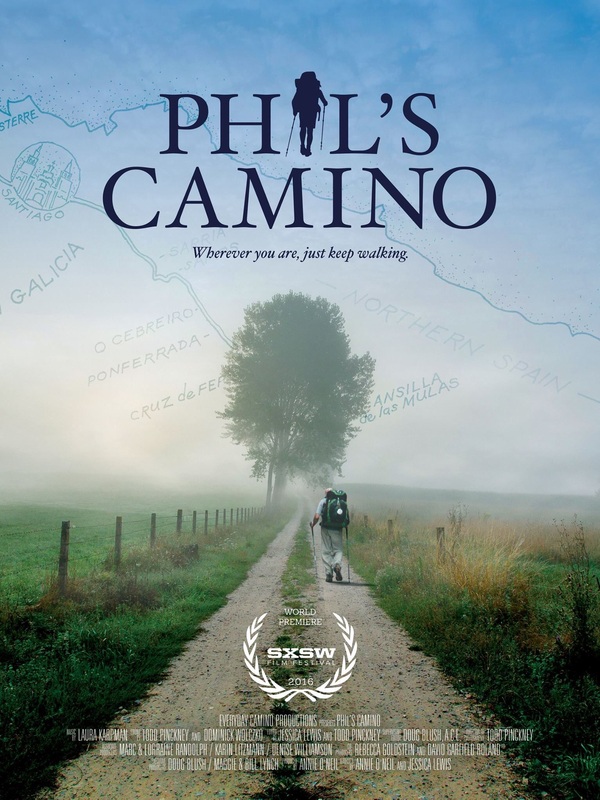 Not only will we be having our World Premiere at the highly esteemed SXSW (pronounced South By Southwest) Film Festival in Austin Texas in March, but our Phil’s Camino team will be joined by none other than the man himself, Phil! Yes, you heard right! Phil and the lovely Rebecca, too, will be joining our team at the World Premiere on Saturday March 12, and for the screening on Sunday March 13 as well. You heard it here first! This is great news for all of us, especially all of us who are going to Austin, because we will get some time to see and hang out with Phil and Rebecca. Also, I have a feeling the filmgoers will be just as happy as we all are to see Phil since the number 1 question I get after every screening of the rough cut I have done includes the question “How is Phil now?” Well, the SXSW audiences will be able to see for themselves! This is very exciting news! Have you told all of your Texas friends yet? Have you told all of your friends who are film buffs yet? People fly in from all over the world to attend SXSW, so you might already know someone who is going. Have you told all your friends who are flight attendants? They have the most flexible schedules and may be able to work their work schedules around to have a layover that will permit them to see our World Premiere, or the Sunday screening! Finally, do YOU want to make the trip yourself? I just found out last week that SXSW offers a special book signing opportunity for filmmakers. I have signed up to do a couple of book signings, which seems especially appropriate, since my book (Everyday Camino with Annie) is a 40 day meditation on my own Camino, and Day 40 is all about Phil. Do you think Phil is blushing yet as he reads this, going “Aw come on!” or something?! Maybe, but I realized long ago that once this film reaches people, they are all going to fall in love with him just as we all have! So I hope you’re bringing your open heart to Austin, Felipe! Our post production work continues at a rapid pace! Our deadline to submit our final DCP (that is the name for the ‘hard drive’ like technology that is how you turn your film over to be shown in a theater) is February 26. Say a little prayer for us, won’t you? And I suppose that it is also just part of my job as Director/Producer that would have me remind you if you would like to make a donation, you can do so at www.philscamino.com . Do you prefer to make a tax deductible donation? Not a problem! 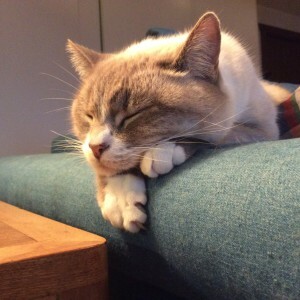 You can do so at our fiscal sponsor, Fractured Atlas https://www.fracturedatlas.org/site/fiscal/profile?id=12789 Our bills are coming in fast and furiously, and every donation is a step along the way. Thank you to everyone who has already donated, many more than once. We are where we are because of you. I think of you, and thank you EVERY day! I am doing my best to be a good steward of your donations, and we run a very tight ship here. I have been donating all my book sales to this project as well, and dream of the day when I can actually take a salary! We are not there yet, and it is more important to finish this film! I just know that this film will touch people’s hearts and souls. I will leave you with a comment from the most recent sneak peek screening. There was a woman there who was waiting for the results of a biopsy. After the film, she said she was so glad that she had seen Phil’s Camino. She said it gave her a different way to look at her own situation, and she was very comforted. She didn’t feel the fear that she had been feeling. Wow! I am so humbled by this film, and of course, as always, by our Phil. Thank you Phil, for being you so completely, so thoroughly. You are an inspiration. 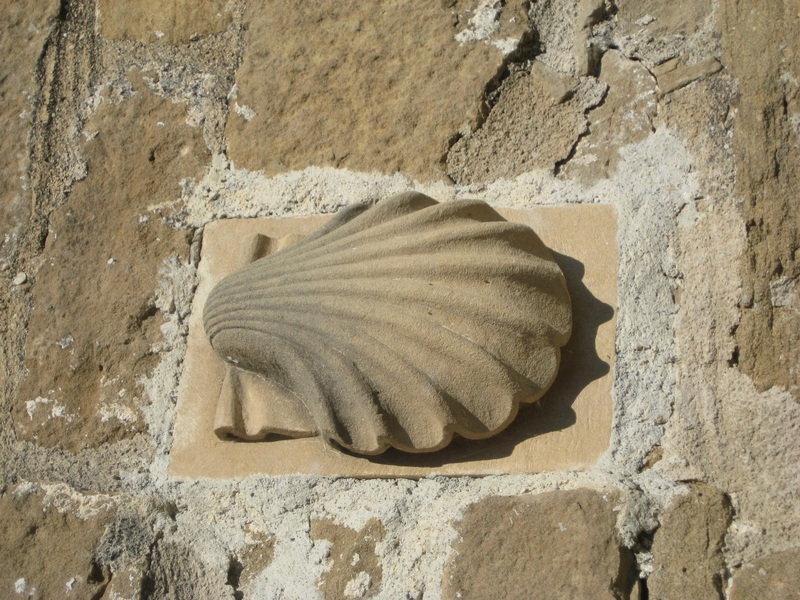 I know where we are, just a few kilometers west of Burgos. The cathedral was most beautiful but great to be out in the boonies again. Our next town is Villabilla de Burgos coming up tomorrow. 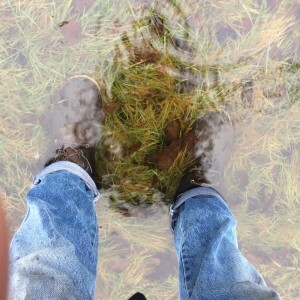 Don’t forget the rubber boots. Felipe. How About Cancer Commando Poets? Color from My Rebecca’s roses of last summer. It’s a direction. It’s an idea. It’s an outlet. It’s a place to hang out, maybe a place of sanctionary. I really like the three words together as they sit there side by side. The plural implies that there are more than one or it is a group perhaps. Well, it isn’t yet, not today anyway. But it is just waiting to happen. My Rebecca started a group called Visual Delights on Vashon on FaceBook with just an idea. Now after a few years there are over 1500 people in it. That’s a group, right? Big day for Felipe today. Mass with Catherine, Reconciliation with Father Marc, Sermon from Terry Hershey on Grace, 40 minutes with Sister Joyce, then Camino walk and tapas to top everything off. Man, I’m going to be blown into another dimension after all that. OK later, wishing you alperfect, love, Felipe.